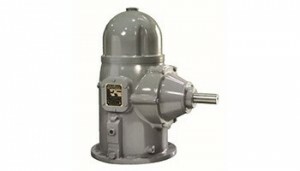 Sterling Line Shaft Turbine Pumps (LST) are the foundation product of our business. 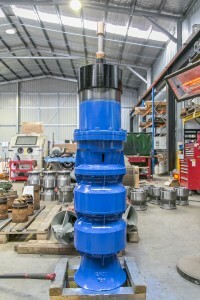 We have our standard range, the VT series offering 5″ 6″ 7″ 8″ 10″ 12″ 14″ 16″ 18″ 20″ and 24″ and flows up to 2,400 m³/h. 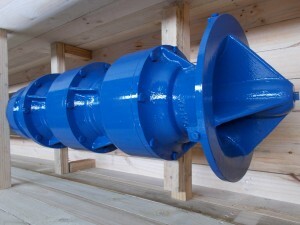 This standard range of pumps are available in cast iron, zinc free bronze and stainless steel with cast iron, bronze or stainless impellers. 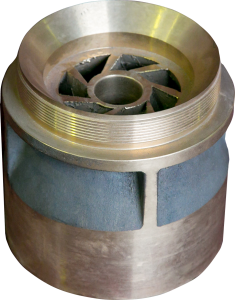 Should our standard LST models not suit your duty, we will trim impellers to get an exact pump output to suit your duty. 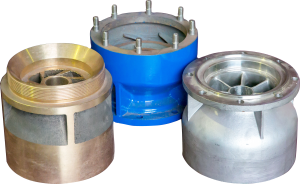 Our standard range also offers low lift/head and high volume Mixed Flow (MX series) and Axial Flow (AX series) turbine pumps, available in 8″ 10″ 12″ 14″ 16″ 20″. 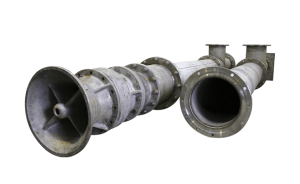 Mixed Flow and Axial Flow pumps 10″ and larger are generally single or 2-stage turbines used to move large volumes of water usually from open bodies of liquid at moderate pressures/head. 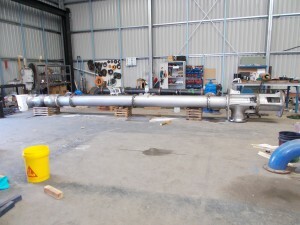 We are not limited to a maximum size of 24″, we can build models up to 90″ and flows up to 40,000 m³/h. 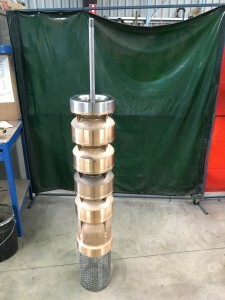 With many diverse pumping applications, standard materials do not always meet the job specifications, so we regularly manufacture turbine pumps in various other construction materials including, Carbon Steel, Duplex Stainless Steel 2205, Super Duplex Stainless Steel 2507 and other corrosion resistant materials such as Nickel Aluminium Bronze, Inconel 625 and Zeron 100. 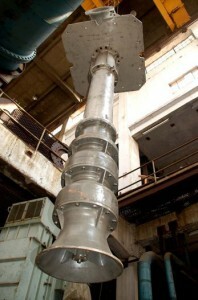 Line shaft turbines are driven in two main ways today, by a direct mount electric motor or via a 90 degree gearbox to a diesel driven engine. 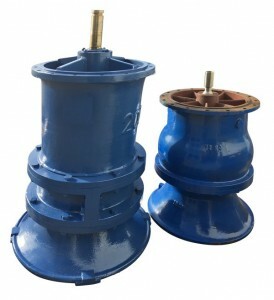 If need be, we can also offer pulley drive to an engine. 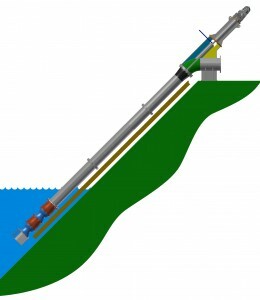 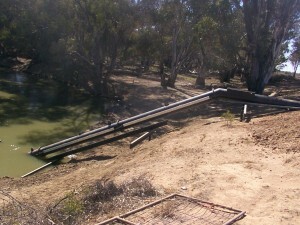 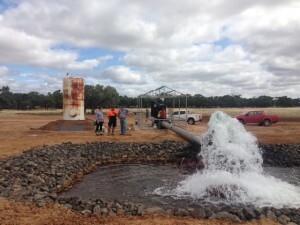 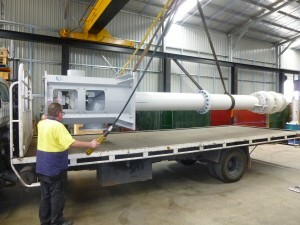 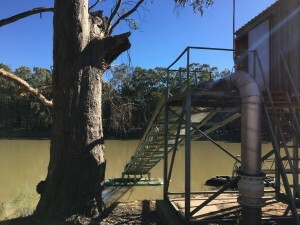 Line Shaft Turbines can be adapted from their general vertical installation for use in rivers, creeks and dams, known then as inclined turbine pumps, a common concept in rural applications. 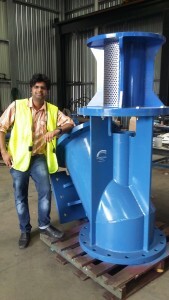 Contact us for more designs and options to suit your needs. 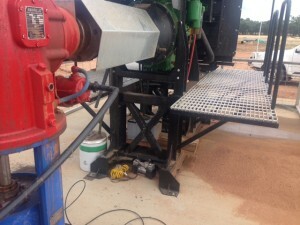 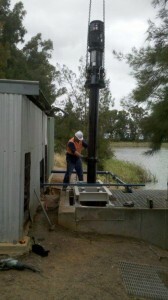 For deeper pump settings, column and shaft extensions are added, usually in 3 metres sections. 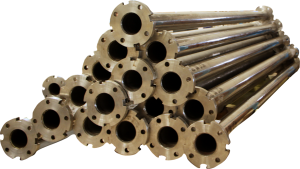 Column is offered flanged or threaded and in mild steel or 304SS as standard with optional materials such as PVC, 316SS and Duplex SS. 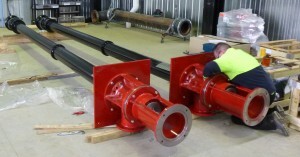 Our specially designed fire systems (FT series) are available in a large selection of flow rates and materials. 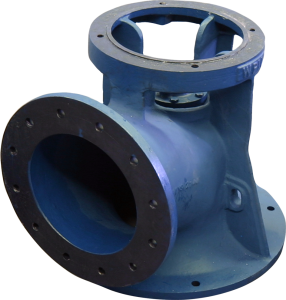 These pumps produces a flat performance curve enabling them to be used in all fire applications including NFPA compliant projects. 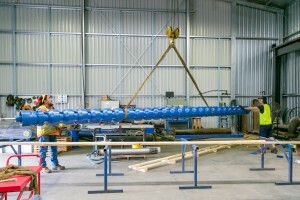 They can be staged as needed to meet specific pressure requirements with length and construction adaptable to meet your specifications. 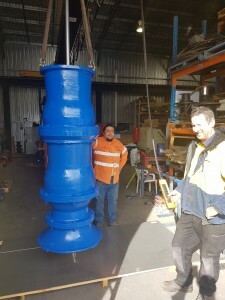 Standard construction offers the discharge head in cast iron with fabricated steel columns, cast iron or stainless steel shaft and head and bronze fitted bowls. 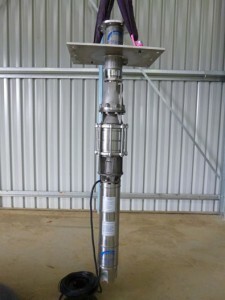 These units do not require priming from 1500 lpm to 18,000 lpm with pressures to 240 Metres of Water Column (MWC). 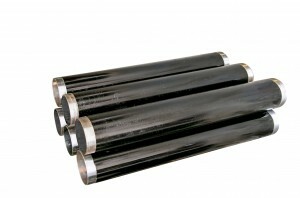 These units are specifically designed for condensate recovery. 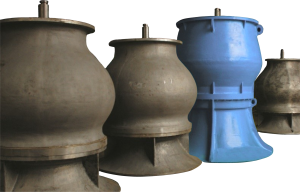 The barrel type design allows for efficient pumping in very low NPSHA environments. 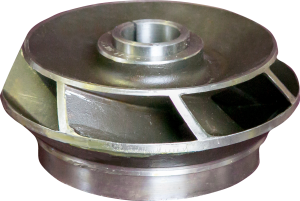 Standard construction materials are carbon steel fitted with graphite bearings, however other material options are available upon request. 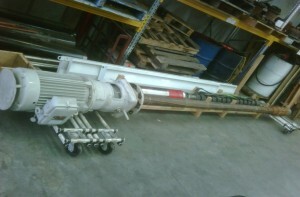 These high flow units are specifically designed for moving large volumes of seawater. 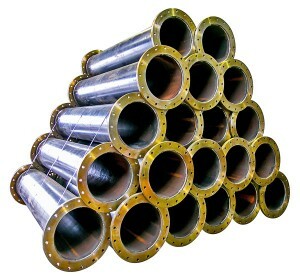 The standard construction materials are duplex stainless steel fitted with silicon carbide bearings. 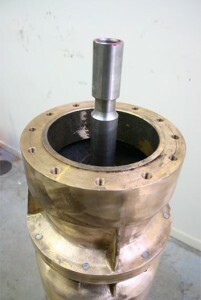 Other material options are available upon request. 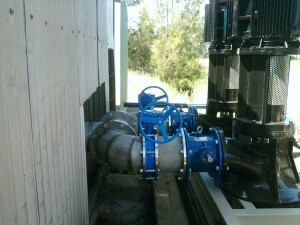 The materials and sealing systems selected for this pump range ensures reliability and long service life. 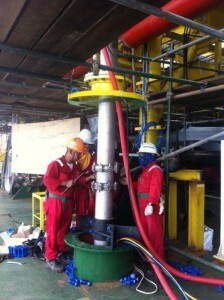 These units are used for pumping fuel and other chemicals from underground tanks. 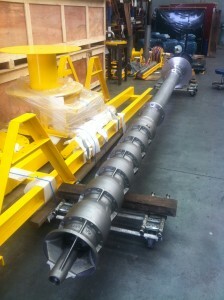 The bowl assembly immersed in the liquid eliminates suction lines and simplifies system design. 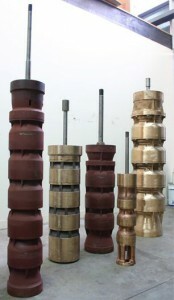 These units are available in many specifications and construction materials to suit your oil, gasoline, aviation fuel or chemical applications. 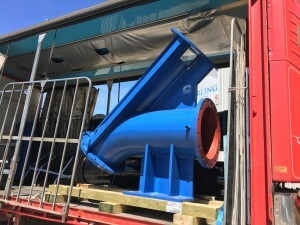 If we do not have the correct Line Shaft Turbine pump model for your application, we can custom design one or more to meet your material and flow requirements. 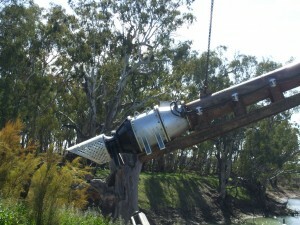 Please use the Contact Us form or phone or email us.